CeBIT 2003 was held actually under the flag of Centrino. Almost everyone there took advantage of the opportunity and announced their connection with this technology. Intel was first to make an official announcement at the showcase. Early in the morning on March 12 Intel proclaimed the advent of the new epoch of a mobile platform - Intel Centrino. This technology is currently talked about most of all. Our readers now a lot of details of Intel Centrino. Intel Centrino technology includes Intel Pentium M processor, Intel 855 chipset family and Intel Pro/Wireless 2100 network interface. All the components are optimized and tested for compliance in mobile systems. The basic features of the new architecture are: Micro-Ops Fusion for more efficient operation and power consumption reduction, Advanced Branch Prediction for latency reduction to make overall performance higher and power consumption lower, and Dedicated Stack Manager which also cuts down the overall number of micro-ops and boosts performance with the power consumption getting lower. Beside the wireless connection means Intel Centrino integrates technologies which heighten run-down time, make notebooks slimmer and boost performance in the mobile operation mode. Pentium M processors utilize 0.13 micron technology and contain 77 M transistors. They have 400 MHz system bus, 1MB L2 cache with idling blocks disabling, and special functions for overall power consumption reduction. The processor supports Advanced Intel SpeedStep technology which dynamically switches clock frequency and voltage, and streaming SIMD extensions (SSE2). Intel 855 chipset family sports two new chipsets developed for the mobile PC market: Intel 855PM for an external graphics adapter, and Intel 855GM with embedded Intel Extreme Graphics 2 core. The chipsets support Intel SpeedStep technology, Deeper Sleep Alert State and an internal timer which disables the clock when it stands idle. 855GM also features a reduced power consumption mode for the graphics subsystem. Both chipsets support IO Hub and up to 2 GB of DDR266 memory. Intel PRO/Wireless 2100 network interface is developed and tested for compliance with 802.11b access points certified for Wi-Fi standard. It's equipped with security facilities for wireless local networks including 802.1x, WEP and VPN technologies with possible software upgrade up to WPA support. Thanks to the partnership with Cisco Systems, Intel Centrino supports Cisco LEAP for mobile PCs with possible software upgrade for Cisco* Compatible Extensions support. The leading manufacturers are starting shipments of Centrino based notebooks. The average price of such systems makes $1,399. 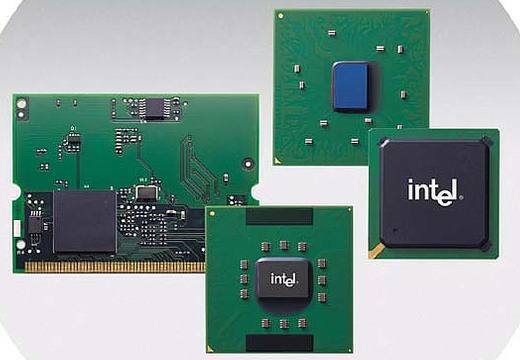 The components of the Intel Centrino technology for mobile PCs (Intel 855PM chipset, Intel PRO/Wireless 2100 network interface and Intel Pentium M CPU at 1.60, 1.50, 1.40, 1.30 GHz) cost $720, $506, $377 and $292 respectively in 1000-unit batches. For Intel Centrino based mobile PCs Intel also ships Intel Pentium M with reduced power consumption clocked at 1.10 GHz and at 900 MHz. Such kits are priced at $345 and $324 respectively. Intel also sells such devices separately.